A strong month on Wall Street ended on a weak note Friday after a late-day sell-off sent stocks down more than 1%. The Dow Jones industrial average fell 209 points, or 1.3%, with most of the selling in the final hour of trading. The S&P 500 sank 1.4% and Nasdaq slid 1%. Despite Friday's losses, all three indexes ended May in the black. The Dow and S&P 500 both gained about 2%, while the Nasdaq advanced nearly 4%. It's the first time the Dow has ended higher in May since 2009, and marks the sixth monthly gain for the index. So far this year, the major gauges are all up about 16%. 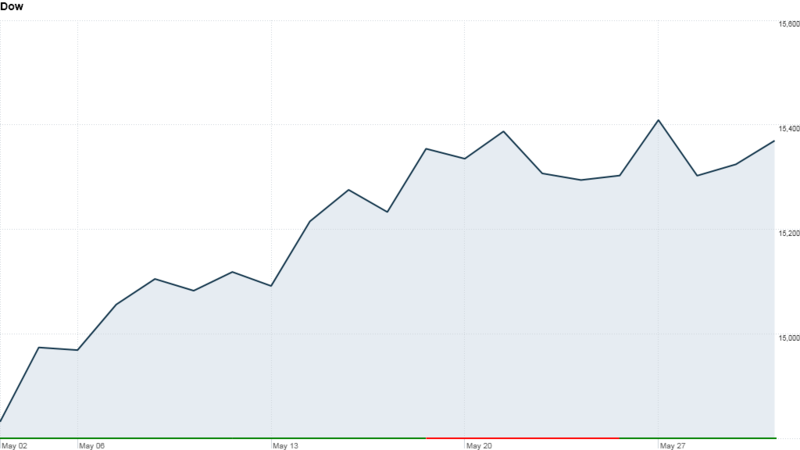 Hewlett-Packard (HPQ) was the best performing blue chip in May. Shares of the PC maker rose nearly 20% this month. Cisc (CSCO)o and JPMorgan (JPM) have also logged double-digit percentage gains. The main laggards were safe-haven stocks that investors had flocked to earlier this year because they pay dividends. Telecoms Verizon (VZ) and AT&T (T) were the worst Dow performers this month, along with consumer staples McDonalds (MCD) and Coca-Cola (KO). The rush out of safe haven investments has also hurt the bond market. Yields on the 10-year Treasury note rose to a high of 2.2% earlier this week, up from about 1.6% at the end of April. Click here for data on commodities, currencies and bond prices. T is for Taper. The jump in Treasury yields, which rise when prices fall, came as investors brace for a potential slowdown in the Federal Reserve's bond buying campaign. Fed chairman Ben Bernanke caused some confusion this month after he told lawmakers that withdrawing monetary stimulus too soon would jeopardize the economic recovery. Later, he said the Fed could decide to slow the pace of its bond buying at one of its next few meetings, depending on how the economy performs. "The bond market suffered through another week of tapering tantrums," said Anthony Valeri, fixed income strategist for LPL Financial. "Ben Bernanke did little to clear the uncertainty over the timing of reducing, or tapering, bond purchases." E is for Economy. Some investors say concerns about the Fed tapering are overblown, since any reduction in bond buying would signal that the economy is improving. While overall economic growth remains sluggish, investors have been encouraged by a robust housing market and signs that consumers are becoming more confident. An index of consumer sentiment rose in May to the highest level in nearly six years. The final reading of the Reuters/University of Michigan index showed that consumers are becoming more optimistic about the economy. But a separate report Friday showed that personal income and spending both fell in April, surprising economists who had predicted a rise. Meanwhile, the Chicago Purchasing Managers' Index bounced back in April, rising to the highest level since March 2012. "Over the past few years, we've seen the economy slow a bit in spring, but we haven't seen that to the same degree this year," said Joel Huffman, a managing director at The Private Client Reserve of U.S. Bank in Milwaukee. "That has helped the market." Huffman added that stocks could continue to move higher as corporate profits rise along with the economy. But he acknowledged that the market remains vulnerable to a correction given the run stocks have had so far this year. "Corporate profits have been positive, but stock prices have gone up more than profits," he said. "A correction of 5% to 10% is certainly within reason." D is for doughnuts. 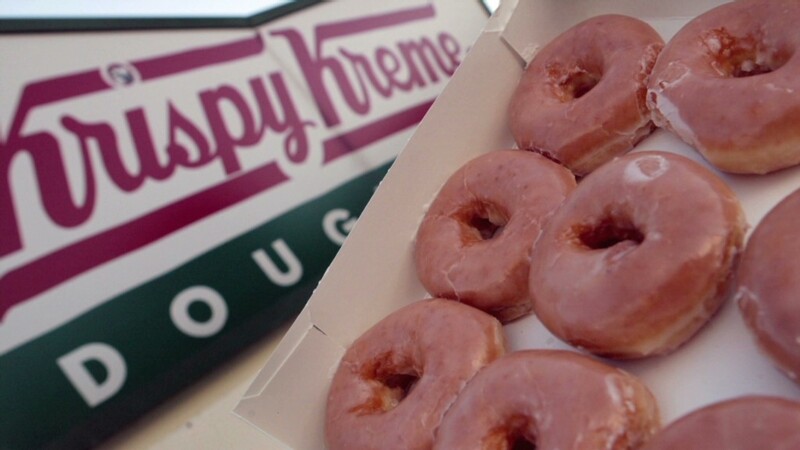 In corporate news Friday, Krispy Kreme (KKD) said sales and earnings jumped in the first quarter, sending shares of the doughnut maker up 13%. Lions Gate (LGF) shares rose after the media company said sales jumped 71% in the past fiscal year, helped by movies in the teen-oriented "Hunger Games" and "Twilight" franchises. Nasdaq said Netflix (NFLX) will join the Nasdaq-100 (NDX) on June 6, replacing healthcare supplier Perrigo (PRGO). European markets took a tumble, but ended off the lows of the day. The London stock market fell nearly 1%, while indexes in France and Germany had smaller losses. Asian markets ended the week with mixed results. The Nikkei advanced by 1.4%, rebounding from Thursday's steep decline brought on by mounting concerns over the country's economic turnaround plan.